Over the past three weeks a number of studio meetings have taken place in which I presented examples of artworks which utilised a wide variety of materials, from those discussions arose a suggestion of using text. Subsequent discussions included consideration of the contexts in which text might be displayed and how meaning is created by the relationship between site and sign. As a consequence of these studio discussions the group questioned the whether or not they wanted to make artwork(s) for a gallery space in Cardiff, as planned. Dialogue about the placement of artworks outside of the gallery space interestingly stimulated two contrasting ideas as to where artworks might be placed, so as to be accessible to Pobol audiences throughout Wales. The first was the use the highly visible exhibition site of the roadside billboard, the second the discrete placement artworks in the landscape, only alert passers-by would discover the hidden works. Clearly one approach does not rule out the other, it remains to be seen which direction the actor/characters decide to take their ideas, maybe ways of connecting the two diametrically opposed approaches will surface. As the project facilitator I am delighted that the actors are so ambitious in considering the possibilities of creating a contemporary artwork as a collective. Serendipitously I found an artisanal soap-maker living in Cardiff, his name Jordan Cuff. Having spent some time searching for a Wales based soap-maker, I was very fortunate to find Mr Cuff, a soap maker with an appetite for adventure. So far we have collected olfactory data on eight characters, using professional quality software to analyse the findings, we have eight bespoke recipes for soap that truly reflect the character’s scent preferences. Almost all the introductions to the characters have taken place, via the actors who play the characters the creation process can begin. Conversations with the actors revealed a wealth of dexterous abilities; there are plumbers, plasters, draughtsman/women, painters, potters, photographers and writers (If writing can be classed as a dexterous act). Awareness of the cast’s creative and manual skills certainly inspires hope in the character’s confidence to participate in the residency activities. As a result of the one-to-one discussions with actors, themes have begun to surface, Themes considered broad enough to accommodate different character perspectives and focused enough to serve as meaningful metaphors for the participatory process. From this point onwards one key concern is to locate the air pockets for play in a watertight work schedule, shooting 70 pages, five days a week! 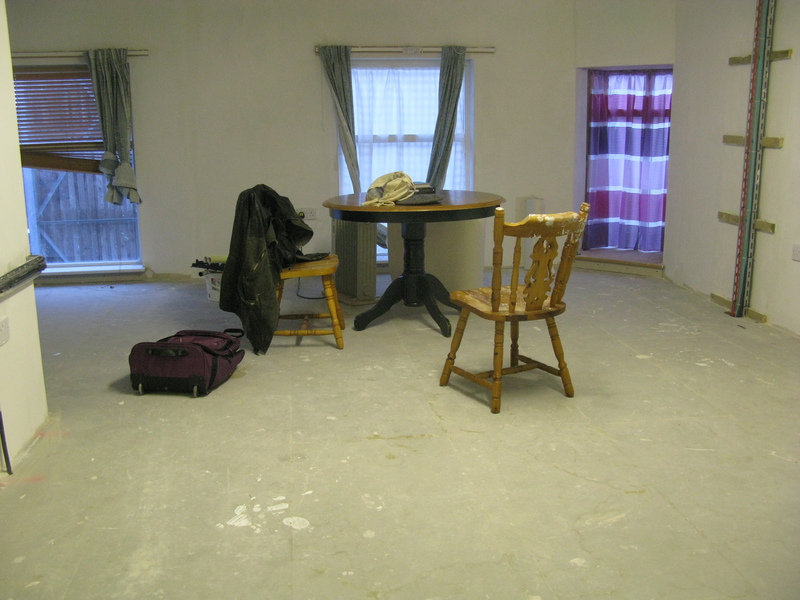 The room above The Deri where the actor, character and artist meet to make creative contact. Meeting the actors on a one-to-one basis, I began to build up a picture of their character’s perspective on the prospect of co-creating an artwork. As with any community, levels of enthusiasm varied depending on the outlook of the character. Focusing on the character’s sensitivity to the visual world each character took a questionnaire I had prepared away with them. Entitled “Cwmderi Eyes” the questionnaire asks the characters to reflect on their experiences of visual pleasure. This initial investigation into the sensory world of the cast of characters continues with a further 25 actor/characters to encounter. Behind closed curtains the residence space is taking shape.